Think of the elegant surroundings and intimate ambience of a boutique hotel and you'll have an idea of the comfort and relaxing lifestyle of these well appointed river boats. River cruising provides an intimate ambiance, ensuring you'll be unencumbered by crowds should you like to find a handsome nook or alcove for some quiet reading or river-gazing. River cruises feature a full line-up of immersive tours that provide many opportunities to see interesting sights, learn about local history and experience cultural life. River cruises offer the convenience of complimentary WI-FI, so you're able to stay connected to the outside world. Additionally, river cruises include regional beers and wines included with dinner. Throughout the day enjoy free coffee and tea. Enjoy unforgettable views and excursions with VIP entrances to many popular sites located in the towns of Europe, Asia and South America. When the ship docks, you have the option of going on the included excursion or purchase an optional one. 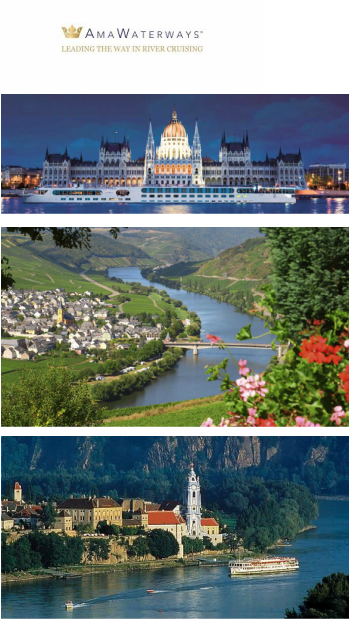 River cruising takes you to captivating destinations such as France, Amsterdam, Central and Eastern Europe. 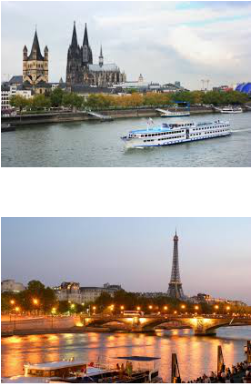 See the sights your way On shore Avalon Waterways offers a choice of sightseeing pace. Choose "Traditional", which takes you to the great sights Avalon is known for; "Leisure", which it's slower pace but it still takes it all in; or "Essential" if you want to see the only the most important sights and have time for shopping or exploring on your own. CHOICES ON BOARD Your Avalon ship becomes your home-away-from-home with a great choice of facilities and amenities to keep you entertained. You can experience entertainment from local musicians. You can attend activities such as, food or wine tasting, demonstrations by local artisans and chefs, and talks by experts about areas through which you're traveling. THE DINING EXPERIENCE From the market to your table the choices are as expansive as the views. You can enjoy hand-crafted dishes from "al fresco" to waterfront room service. Avalon makes meal times a delightful part of your adventure with variety and choice you'll savor. Avalon brings you hand crafted cuisine from the region through which your're traveling, or more familiar Western dishes. Always a la carte. ﻿﻿ENRI﻿CH﻿MENT﻿﻿ Cruise to a place not to a port. See the places and things along legendary rivers. Step off your Avalon ship and find yourself in the heart of historic cities surrounded by ancient ramparts, cobblestones and castles. Have VIP access to must-see sights which means no waiting in lines. With only 118 guests, you can eat drink and be merry, travel in good company and never settle for ordinary. Tauck's all included shore excursions are incomparable. You'll will never just stop by a monument or see it through a window. Instead you'll have the opportunity to stop to see, smell and experience it first hand. You can explore Europe like an insider. Find out what is like to to live in a palace like Lobko Wicz Palace known for its hospitality, service and beautiful rooms. Enjoy dinner, music and dancing in the palace and feel as you've been invited to a diner party. Experience an Slovakian Wedding and folklore. Listen to local speakers that offer enrichment of the local culture. Arrive at the Château de Rully, a private castle in Burgundy, France. The castle has been with the same family since the end of the 12th century. When arrival, they receive you in the main entrance, from there you can visit more intimate spaces. At the end of the tour enjoy wine tasting in the kitchen. EAT DRINK AND BE MERRY Experience local cuisine, cooking lessons and wine tasting from Scook, a popular cooking school in Valence, France. On the ship the chef brings local ingredients, cheeses and spices that enrich your experience. Enjoy coffee from the best coffee houses. Sample high end products such as cold cuts and cheeses from Les Halles de Lyon a popular food market located in Lyon, a city in east-central France. ART, MUSIC﻿ AND CUL﻿TURE The Lobkowicz Palace located in the Czech Republic brings the culture alive. In the music room you can find scores that are original performing parts of hand written annotations in Beethoven's own hands. This is something you can't see anywhere else in the world. Enhance your cultural experience at the Palais Pallavicini located in Vienna, Austria, where music masters such as Beethoven and Mozart both played at. Beneath the ball room you can find the best acoustics in Viennan palaces. There you can enjoy great Opera music and Art. THE VIKING RIVER CRUISES EXPLORE THE WORLD IN COMFORT Viking River Cruises offer a quiet environment and opportunities for relaxation. You can free your mind and relax your spirit. Viking River Cruises hand picks individual to work for them. Your journey is enhanced by a cultural curriculum program, lectures, performances escorted tours with head phones. There are English speaking tour guides that are born and raised in the place you visit, providing a personal insight. ELEGANCE AND COMFORT IN EVERY ROOM AND INTERIOR Designed with comfort and elegance in mind with under 200 guest, you'll never feel crowded. Every stateroom has an outside view of the changing scenery. the architecture is open and welcoming. The top deck is uncrowded with 360° views. You can find signature Scandinavian decor, the dining room feel intimate, and a well stocked library is ideal for a quiet moment. Enjoy free WI-FI which makes staying in touch with family and friends easier than ever. The cabins are beautifully furnished and comfortable. They are stocked with shower products, temperature control, a safe, and bottled water. ALL INCLUSIVE Viking all inclusive price includes accommodations, meals, wine, beer and soda drinks with dinner. Port charges, lectures, WI-FI, and enrichment activities. Viking includes a shore excursion in every port. The price never changes even with currency rate changes, Viking also offers Cancel for Any Reason Travel Protection program, which covers %100 of your travel investment. It also includes all inclusive air travel surcharges and taxes. CULINARY EXPERIENCE Delight your taste buds with an incomparable breakfast that is buffet style. Lunch is presented with wide selection of flavorful dishes. 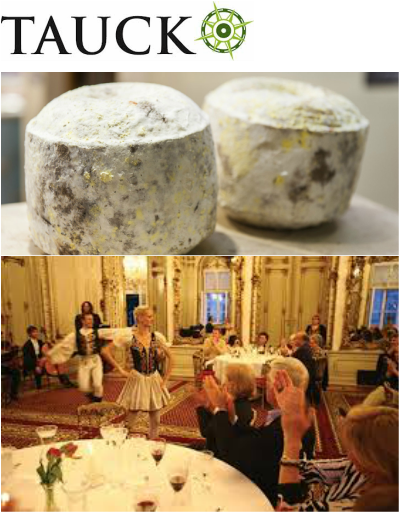 Dinner is a five course master piece that involves the culture in which you visit. Enjoy the convenience of open seating, wine, beer and soda drinks with lunch and dinner. Selections onboard will keep you engaged lectures on history, cooking classes and hands on demonstrations. 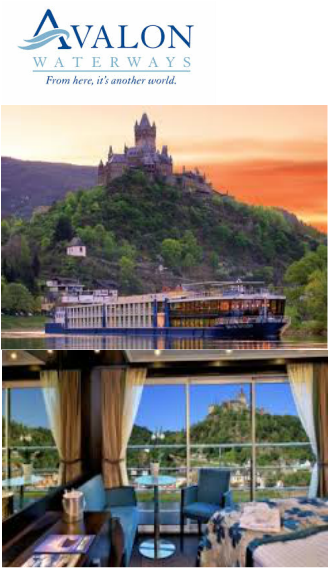 UNIWORLD BOUTIQUE RIVER CRUISE COLLECTION - FULLY HOSTED SHORE EXCURSIONS are guided by the most dedicated and passionate Cruise Managers and knowledgeable local experts. And with portable audio-headset systems on all shore excursions, you can always clear commentary from your guides. UNLIMITED BEVERAGES ONBOARD Enjoy distinctive wines;craft and regional beers; spirits; cocktails; soft drinks; juices; cappuccinos,lattes espresso, and French-press coffee; a collection of fine teas; and mineral water. ALL MEALS ONBOARD Delight in the wonderful flavors of impeccably prepared meals by their culinary team using the freshest ingredients from farmers' market and other local sources. ENTERTAINMENT AND CULTURAL ENRICHMENT Cultural and art historians give you knowledge of the region with their onboard Signature Lectures, while local artists and musicians provide captivating entertainment, so you'll gain a greater understanding of the place you visit. ONBOARD AMENITIES AND CONVENIENCES Enjoy complimentary amenities, such ans Internet and WI-FI access onboard, and in-stateroom infotainment center, a well-equipped fitness center, and complimentary bicycles and Nordiac walking sticks. ALL SCHEDULED AIRPORT TRANSFERS Be greeted by a welcoming smile and a warm good-bye at the airport, as all scheduled transfers on arrival and departure days are included. GRATUITIES ALWAYS INCLUDED Your luxurious river cruise is designed to be hassle-free and truly all-inclusive, which is why all gratuities fro onboard and onshore services are always included. WINE CRUISES An AMAWATERWAYS wine cruise is a unique way to add enhanced epicurean aspect to a European river cruise. Guests enjoy activities that highlight wine making, wine tasting and the rich history of the region's renowned vineyards. You can experience and unforgettable epicurean experience. Excursions that teach you about Old World wine heritage, with tours and wine tastings at local vineyards, wineries and wine cellars. A wine expert who brings hand-selected wines on board and hosts tastings and discussions. A lavish dinner during which each course is specially paired with a different wine under the oversight of the head chef and wine expert. BEER CRUISES These special itineraries are designed to provide guests with unique beer experiences, such as visits to breweries and tastings of local favorites. Beer cruises included the following activities at no extra cost. Hosted by beer expert Don Russell (also known as Joe Sixpack), author of three books and winner of numerous journalism awards. 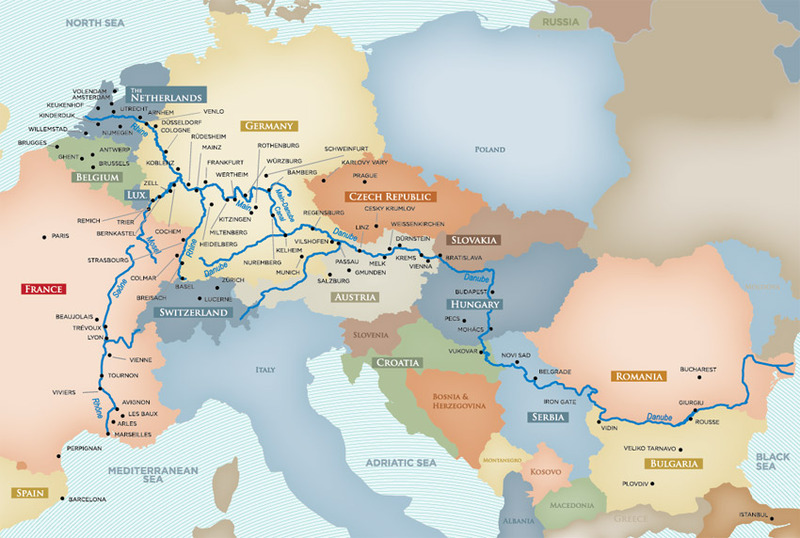 JEWISH HERITAGE CRUISES AMAWATERWAYS offers four Jewish Heritage Cruises in 2014 that highlight ancient culture, modern museums and historical monuments dedicated to Europe's rich Jewish legacy. In Budapest, visit the second-largest synagogue in the world, the Dohany Steet Synagogue, as well as the city's acclaimed Jewish museum. JAZZ CRUISE Together with Jazzdagen Tours, AMAWATERWAYS will host a cruise on the Danube that will feature exclusive onboard jazz performances by musicians from around the world. In port, enjoy onboard jazz performances by musicians from around the wold. In port. enjoy immersive tours of grand capitals like Vienna and charming towns like Dürnstein. On board, relax to the smooth sounds of hours of daily live jazz sessions.